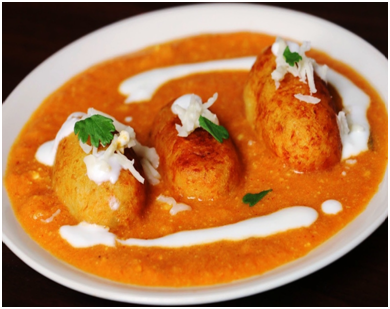 Malai kofta is a north Indian dish. Malai kofta can you make with onion, garlic but today I am making without garlic, onion which can be made during fast and can be considered jain dish as well. Mash paneer, add grated boiled potatoes 1-2tbsp maida, salt mixes them together. Make small ball off it and keep a one kismish and little fine chopped nut inside it then roll it and fry it.Drain on paper towel and keep aside. For gravy first soaked cashew, soaked and peel almond, add tomatoes, coriander powder, cumin, with other spices make a puree of it by using a grinder.Make it a thin paste. Heat oil in a pan put this paste in a pan and saute till the oil begins to start separate, add little curd mix fast then reduce the fire to simmer. Add gently koftas to this gravy, and stop cooking. Malai kofta is ready to add a little cream, serve it.